As Lost Liverpool returns, Getintothis’ Banjo looks at the Teardrop Explodes and their Club Zoo folly, where one of Liverpool’s most famous bands went off the rails. The late 70s and early 80s were an incredibly fertile time for the Liverpool music scene. The city felt the punk explosion very strongly and responded with a collection of bands notable for their variety and for shying away from the three chord punk sound taken up by many new bands of the time, opting instead for a calmer, more thoughtful, more Liverpool sound. Big In Japan were perhaps the first to heed the call, later becoming known as a supergroup in reverse, where all members went on to found/join hugely successful outfits after the band split (KLF, Frankie Goes to Hollywood, Lightning Seeds, Siouxsie and the Banshees and Quireboys amongst them). Based around Liverpool’s famous Eric’s club, a scene developed with many excellent local bands taking to its small sage for their first tentative steps. Chief among these were Echo & the Bunnymen and Teardrop Explodes. Both bands debuted at Eric’s, shared a label in Zoo Records and a manager in Bill Drummond. More impressively, both became widely successful, with top ten hits in the singles and album charts, Top of the Pops appearances and large scale tours. But while the Bunnymen thrived and prospered, for many years, the Teardrops fell by the wayside, alienated from their audience and disillusioned with the reality of being a successful pop group. Subconsciously they (or at least lead Teardrop Julian Cope) withdrew from the spotlight and even tried to sabotage their career. Perhaps the start of this process, of how they dealt with a sudden onrush of fame and their recasting as a pop group, can be found in the legendary run of gigs they performed under the banner of Club Zoo. 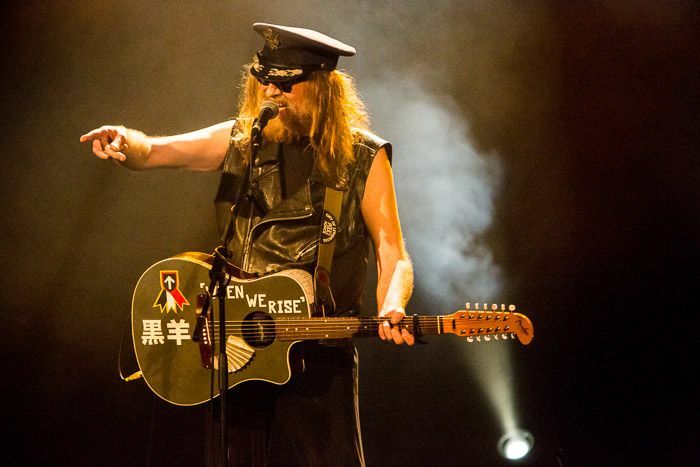 Moving from Tamworth to attend college in Liverpool in 1977, the young Julian Cope arrived into a city with a vibrant emerging music scene, the like of which he had never encountered before. Throwing himself head first into the scene, he joined various bands that existed for perhaps an afternoon, never rehearsed and had no songs or even instruments. Centred around the trinity of Eric’s, Probe Records and the Armadillo Tea Rooms, the Liverpool scene of the time consisted largely of imaginary bands that seemed like a good idea when trying to make a pot of Armadillo’s tea last all afternoon, but never progressed beyond the hypothetical. Eventually some of these bands made it to the rehearsal stage, including the prophetically named Crucial Three, featuring Ian McCulloch, Julian Cope and Pete Wylie, along with a drummer whose name has been cruelly erased from rock history. Never making it to the gigging stage, the world sadly lost the chance to enjoy songs such as I’m Bloody Sure He’s On Drugs and Out Of My Mind On Dope and Speed as the Crucial Three split, thereafter to be confined to legend. Out of this creative chaos came the Echo and the Bunnymen and The Teardrop Explodes. 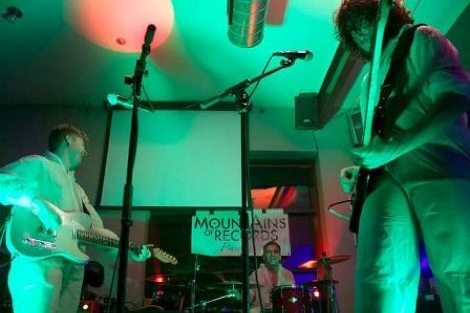 Rushed into a studio, the Teardrops recorded the only three songs they had and released them as an EP, called Sleeping Gas. Within days, it was Single of the Week in the UK’s weekly music press. Still very much an underground prospect, Teardrop Explodes and Echo & the Bunnymen went on a joint headlining tour, reasoning that they had more chance of attracting people to their gigs together than they did apart. Both bands progressed well, with the Bunnymen taking an early lead in both record sales and making inroads into the charts, but the Teardrops‘ time soon came, when their Reward single hit the top ten. To celebrate, Julian Cope appeared on Top of the Pops in a nightshirt, tripping on acid. While their early releases saw them branded with a ‘New Psychedeila’ tag, Julian was now faced with the unexpected prospect of becoming a pop star. Following Reward’s success, their previous single, the mighty Treason, was re-released and became another top ten smash. Julian appeared in Smash Hits and screaming fans started to appear at their gigs. While one suspects that there was a part of Julian Cope that revelled in all this, part of him was still the underground punk-turned-psychedelic-warrior, cherishing records by The Residents and Pere Ubu and, like Kurt Cobain after him, felt guilty and embarrassed by his fame. His reaction to this was to retreat from pop, record an album designed to turn off his pop fans and to take enormous, heroic amounts of LSD. When it came to pop, he preferred it to be Iggy – onstage at London’s Hammersmith Palais, Julian broke a mic stand and dragged the sharp metal edges over his skinny frame, drawing blood and scarring his stomach. Try as you might, it is difficult to imagine the likes of Tony Hadley or Nik Kershaw trying that one. A period of name changes and sub-identities followed, where Cope renamed himself Kevin Stapleton, Teardrops’ drummer Gary Dwyer became Buff Manila and the band were rechristened Whopper. Encouraged or inspired by their friend/mentor/manager Bill Drummond and his love of artifice over success, Teardrop Explodes decided to eschew a traditional tour, where they would be playing large venues to their new fans and instead decided that the fans must come to them. 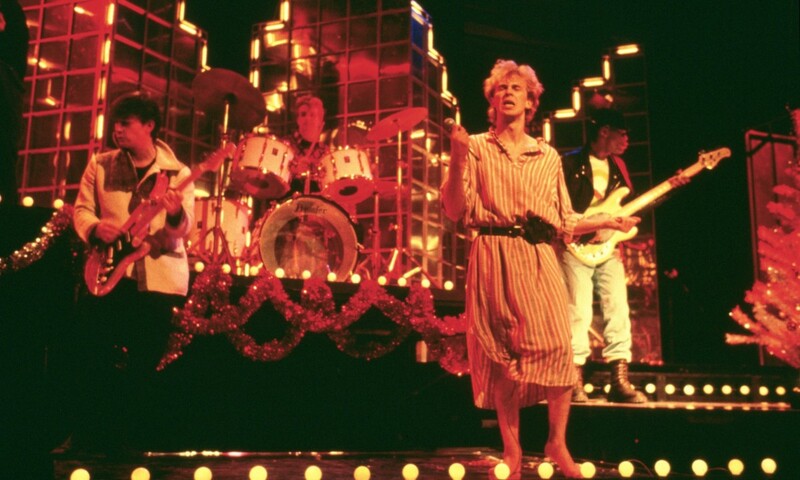 It was decided that Teardrop Explodes, one of the UK’s biggest new bands, would instead take over Liverpool’s Pyramid club and play two sets a day, every day for six weeks.The nights were to be known as Club Zoo and would feature different support acts each night, installations and ‘happenings’. Seeing this without context may make this decision seem stranger than it did at the time. In the 80s many bands post-punk sensibilities meant they were keen to do things differently, to not use traditional methods or traditional routes. The term ’rockist’ was coined to identify things that were felt to be the preserve of older bands, that were now seen as uncool and that were to be avoided at all costs. Out went rock guitar poses, concept albums and solos. Even releasing albums and the act of touring were called to account for being old hat, with alternatives being investigated. Examples of this period of self reflection include The Cure touring with their strange Carnage Visors film playing instead of a support act, and PiL looking into video tours and performing behind screens. In this atmosphere, the Club Zoo idea may not have been seen as such an unusual one. But whilst the concept may be applauded as a brave move and one with good intentions at its heart, it was perhaps doomed to failure before it even started. The Teardrop’s new, young audience were unlikely to travel to Liverpool to spend an evening in a grimy club, especially as it may well have meant an overnight stay. While committed fans of the punk and post punk bands of the time were perfectly content to doss in a train station or bus shelter overnight for the privilege of seeing their bands perform, this was a lifestyle and a commitment that was alien territory to pop audiences. These audiences, it seemed, were less concerned with redefining rock’s rule book and more with having a straightforward good night out – they would rather go to a gig, see it and go home. Of those who would make the effort, or who lived nearby, how many would want to return for important repeat business? One has to wonder whether even the most dedicated Teardrops fan would be prepared to see them perform a total of 84 times in a six week period. As a result, the Club Zoo gigs were drastically under attended. Worse still, Julian Cope had decided to live at the venue while the shows were going on, turning The Pyramid into a bunker of acid fuelled madness. He drew and redrew a black ‘X’ on his stomach in marker pen in an attempt to ward off evil spirits and turned the top floor into his living space, renaming it ‘The Sanctum’. Here he would avoid people, even the rest of his band, taking whatever drugs were passed to him. Gigs were erratic, with Cope stopping songs to berate audience members for talking during the performance, wandering into the crowd and even giving his clothes away. At one gig, an audience member by the name of Boxhead taunted Julian. After Like Leila Khaled Said, Boxhead shouted; “Wow that was really emotional man,” and Cope jumped of stage for a scrap with his tormentor while the crowd circled to watch. Haircut 100 this was definitely not. Looking back, the Club Zoo gigs can be seen as perhaps the beginning of the end for the Teardrops, the point where ambition, potential and even a career path went off the rails. Success was theirs to lose, but drugs, guilt and mental deterioration seemed to make deliberate failure a much more likely prospect. Despite what was going on within the band, the level of anticipation for the next Teardrops album was such that Cope wanted to call it Everybody Wants to Shag The Teardrop Explodes. The alternative universe title for the album was the even worse; Ten More Belters from Whopper. Much less commercial sounding than their debut album, Kilimanjaro, it unsurprisingly sold less and its singles failed to reach the top 30. Within a year of the Club Zoo gigs the Teardrop Explodes were no more, splitting after a terrible tour as a three piece where it was hard to decide who was enjoying it least, the band or the audience. It is useful here to recall the words of the Teardrop’s press officer, Mick Houghton, who wisely reflected that “Success does not breed success, success breeds confusion”. The Teardrop’s flame burned bright but brief, although time has been kind to them and their records. While very much reflecting their time, they still sound fresh and wonderful today. Both Teardrops’ albums and Julian‘s Head On memoirs come highly recommended. Maybe you could listen to them and reflect on whether they should have done anything different at all. They may not have succeeded, but they failed magnificently.